Screenshot via NBC NewsRussian President Vladimir Putin. Russian President Vladimir Putin made controversial statements about Jews and several other groups in Russia, shifting the blame to them for Russia’s interference in the 2016 US election. Jewish groups condemned Putin’s remarks. Putin also suggested that it was unclear who was financing the interference, and maintained that they had no ties to the Russian state. The main financier of the Russian effort is a close Putin ally, US intelligence agencies have said. President Vladimir Putin of Russia elicited sharp blowback when he claimed that even though individuals with Russian citizenship may have worked to interfere in the 2016 US elections, they may not actually have been Russian because of their Jewish faith. 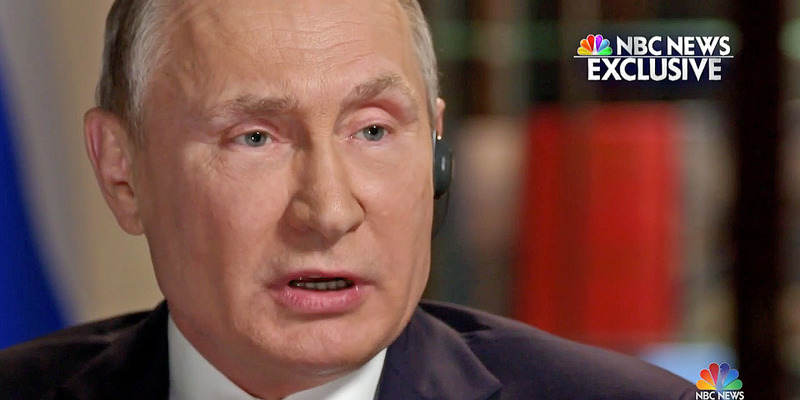 Putin made the remarks during a long interview with NBC News host Megyn Kelly that aired on Saturday. When Kelly asked him about the 13 Russian nationals indicted by special counsel Robert Mueller for interfering in the election, Putin claimed that even though the individuals could have had Russian citizenship, they might not have been Russian after all. Tatars are a native non-European people who live in Russia. Putin’s claim that someone who is not ethnically Russian cannot truly be Russian despite having citizenship elicited a sharp outcry from Jewish groups in particular who stated that his suggestion was anti-Semitic. “The Protocols of the Elders of Zion” is a well-known anti-Semitic book that likely originated in Russia. It has been widely used to spread mistruths about the Jewish people. Members of Congress condemned the remarks, as well. “Repulsive Putin remark deserves to be denounced, soundly and promptly, by world leaders. Why is Trump silent? Intolerance is intolerable,” Sen. Richard Blumenthal of Connecticut said on Twitter. Rep. Don Beyer of Virginia urged Trump to enforce the sanctions against Russia that Congress passed. “This man is not our friend,” he tweeted. Putin’s controversial statements came amid wider comments about interference in the 2016 election – and his efforts to shift the blame from the Kremlin. He said it wasn’t clear that the individuals mentioned in Mueller’s indictment had any ties to the Russian state, and that they may have worked with France, Germany, governments in “Asia,” or even the US government itself. Despite Putin’s attempt to shift the blame, the Internet Research Agency (IRA) that served as the hub of the Russian interference effort was funded by Yevgeny Prigozhin, a man who has been called “Putin’s Cook” and has close ties to the Russian president.